1. A good undergraduate degree from a recognised university – typically at least a UK Second Class Honours (2:2) or the international equivalent. For more detailed information about the degree requirements, please refer to UCL’s official website . for international students. * A minimum GMAT score (or equivalent) is not specified. However, it is recommended that applicants apply with a GMAT score (or equivalent) of 600 or above. ● Achievement indicating a ‘standard’ level of English in any alternative English language qualification or test recognised by UCL. Please refer to UCL’s official website to get more information. Candidates need to successfully submit the online application first. All the supporting documents need to be uploaded. You can access to our online application system here . When online application has been approved, your interview will be arranged. The 40-minute interview consists of self-introduction and theory interpretation and it will be held by our admission committee members. Candidates can choose to submit GMAT/GRE test score or take PKU-UCL on-campus test. Candidates will receive admission decision within 6-8 weeks. The analytical test includes two parts: Abstract Reasoning Ability Test and Numerical Reasoning Ability Test. Abstract Reasoning Ability Test measures the participant’s ability to deduct rules from abstract information and apply them to new information. Candidate needs to interpret the abstract graphs, deduct the rules and apply them according to the question’s requirements. Numerical Reasoning Test measures the participant’s sensitivity to data and the ability which is to use and summarize information. It shows candidate’s ability to use data as well as deduct information ability. Through the analysis of existing data, candidate needs to use and integrate information according to the question’s requirements. The tests are multiple-choices questions, which contain 4-6 choices, but only one choice is correct. You can find testing examples here ..
*MBA candidates please select Abstract Reasoning for Middle and Senior Manager and Numerical Reasoning for Middle and Senior Managers, other test sample are irrelevant to formal testing. Applicants who have passed the application screening will be invited to a personal interview in English. The admission interview is both evaluative and informative: it is not only an opportunity for us to learn more about you, but also for you to learn more about BiMBA. The interview is 40 minutes and conducted by Deans & Directors, Alumni or Faculty Members. The interview will contain two parts: the first part will be a Q&A session and take 25 minutes; The second part will require you to give a 10-minute presentation and the topic will be emailed to you one week before the interview. The evaluation will be based on a comprehensive approach to assess the applicants' learning ability and career potential. The interview probes applicants’ motivation to attend the program of their choice, their background, their interest in management sciences, and their insights into their own personal strengths and weaknesses, their future career path, communication skills and also assesses their contributions to the group. The final decision on admission will be made by the admissions committee of BiMBA. For overseas applicants, telephone or video conference interviews can be organised. However, a face-to-face interview is preferred and highly recommended. * The overview of the company should include the overview of the company (public, private, or non-profit), the management, and the product(s) or service(s) and the market position in its sector. Please also provide the company's organizational structure as it relates to you (department specific). Any questions please email us at admissions@bimba.pku.edu.cn . BiMBA is committed to offer a wide range of scholarships to support and encourage talented MBA students from China and all over the world. 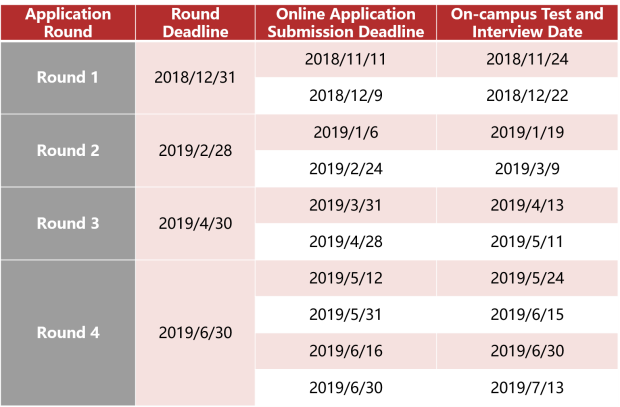 There are 70% Full-Time MBA students and 20% Part-time MBA students will receive scholarships in 2019 BiMBA Scholarship (check the form below for more detailed information). Who needs a student visa (X visa)? According to China's law, foreign students are required to obtain Student Visa (X visa) during their study at Peking University. Students from Taiwan, Hong Kong and Macau do not need student visa. What type of visa is offered by BiMBA? Peking university international students’ office only issued student visa to full-time international students. Part-time students should consult with their employers for working visa. How to obtain a Student Visa? Fill in the Student Visa Application Form of Peking University (download here) and submit it together with your application package. When you receive admissions offer from BiMBA and confirm your enrollment, we would help you get the “original copy of the university’s admission notification” and a “Visa Application Form for Foreign Students Studying in China (also known as JW202 form)”. Use these documents to apply for a Student Visa (X visa) at the Chinese Embassy or Consulate in your home country. * Some Chinese Embassy or Consulate General will require a medical check report for visa application. Please contact local Chinese Embassy or Consulate General for details. Do make sure that your letter of admissions and your JW202 form is handed back to you together with your passport after obtaining your Chinese visa. You’ll need these documents to apply for your Residence Permit after your arrival in Beijing. What’s the deadline for visa application? The deadline is June 30th, 2019. We suggest earlier applications. How long does the visa allow students to stay in China? Full-time MBA program could be finished within 16 months. Therefore, the visa period is 16 months. How to renew your student visa? Please come to China ten or fifteen days before the class starts, you'd better to prepare the above documents before the class begins so that you could finish the renewal procedure within one month. Peking University is located in the Haidian District near to the North West 4th Ring Road. It can easily be reached by subway line 4 at Beidadongmen Station or line 13 at Wudaokou Station. Therefore, it is good to find an apartment near to the subway line. A 2-bedroom apartment may cost you USD 900-1200 per month. All BiMBA students live off campus and most of them share a two-bedroom or three-bedroom apartment, taking into consideration of the lower cost, better housing conditions and easier access to community facilities, such as bars, book stores, restaurants, shopping malls and places of interests. Besides, most of them think it is exciting to experience life in Beijing as local people do. International students can apply to live in the PKU's international students' apartment (USD 500 per month for one bedroom of a two-room apartment). BiMBA staff will help students get information on housing. However, students themselves need to look at possible places of residence and sign contracts with real estate agents. Students eat on campus using their food card mostly; the cost of three meals a day is about US$ 3.5-4. There are many choices of food in Beijing, both Eastern and Western. Eating in restaurants may cost US$ 7.5-10 per person – or more. Taxis are widely available in Beijing and they are extremely cheap compared to most cities in the world. Most rides vary from US$ 2 to 5. From the airport to the Peking University Campus (about 40 km) you might expect to pay around US$ 19. Bike is a cheap and healthy way of moving around, and sometimes it is the most convenient transportation method around Beijing due to bad traffic and crowds in the subway. Sharing bikes are available at anywhere of Beijing now, just download apps like Mobile and OFO and registered then could enjoy the beneficial of riding bikes. BiMBA partnering with Sinology Institute provides enrolled students with quality language learning courses of all levels to make your life and study much easier here in Beijing.